A collaboration between Middlesex University and the Royal Free NHS Foundation Trust will give nurses trained outside the UK the chance to complete a transition module to be fully qualified as nurses in the UK. The pilot programme was officially launched on Thursday 19 March at a celebration tea held at Middlesex University's London campus. Students of the new module, Middlesex staff and representatives from the Royal Free NHS Foundation Trust and Health Education North Central and East London (NHS) attended the event to mark the commencement of the new APEL Route to NMC Nurse Registration for Overseas Trained Nurses Pilot Project. Although the students commencing the module are already qualified as nurses, their overseas qualifications are not recognised as the equivalent of a British BSc degree. As a result, they are not able to practice and often end up working in healthcare support roles. "At a time when the country is desperately short of nurses, it is a scandalous waste of talent that so many nurses that have trained overseas are unable to complete registration as a nurse in the UK," said Kay Caldwell, Professor of Nurse Education at Middlesex. 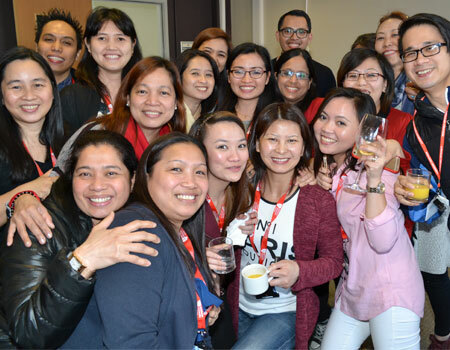 "Middlesex University is committed to opening up opportunities for this group of staff, currently employed as support workers, to undertake a route to registration through our pre-registration nursing programme. This is a great example of our strength in partnership working and meeting workforce development needs." Find out more about Middlesex University's contribution to nursing.